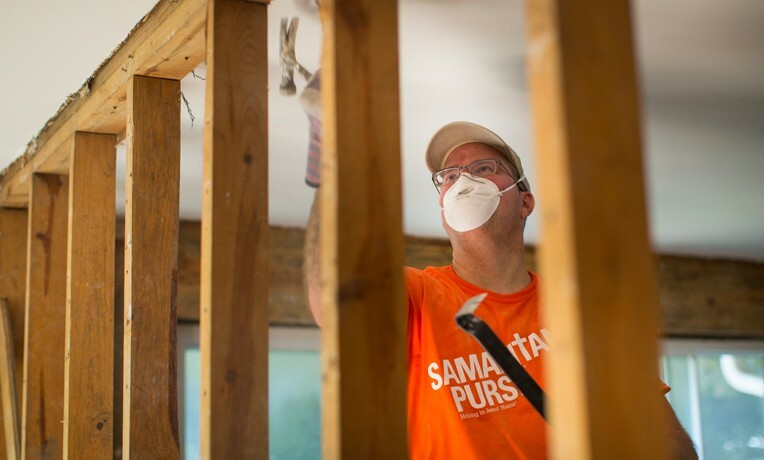 Samaritan’s Purse volunteers recently completed fruitful deployments in both states after floods devastated homes. When wave after wave of powerful storms pummeled southeast Wisconsin and then northeast Illinois in mid-July, Samaritan’s Purse responded quickly to massive flooding in both states. Our volunteers prepare to cut and remove sections of waterlogged walls. We sent in staff and relief supplies, and then God raised up more than 500 volunteers to come alongside devastated homeowners and serve them with the compassion of Christ. Both deployments ended within the past week, and we praise the Lord for all He accomplished, especially the salvation of 26 individuals. In Wisconsin, 328 volunteers assisted 164 families. Kristy and Patrick Beaudette were among the beneficiaries. “We knew there were storms rolling in, but when I woke up about 5 a.m. I stepped out of bed into about five inches of water,” Kristy said. It only got worse throughout the day. Nearby retention ponds overflowed, sending floodwaters cascading down the hill into the Beaudette’s lower level, where the couple and their four children mostly live. Within 24 hours, the basement had taken on about 48 inches of murky water. Our team members presented a Bible to homeowner Kristy Beaudette after work at her flooded property. Their sump pump kicked in though, and the water eventually receded, enabling Patrick to haul out water-logged belongings to the curb. But they were overwhelmed with what to do next. Kristy heard that Samaritan’s Purse volunteers were in the area, so she contacted us. A 14-person team came out and worked several days. They tore out damaged flooring and walls, up to the ceiling. Then they sprayed for mold. Afterward, they presented a Billy Graham Study Bible, signed by all the volunteers who worked on their home. Homeowners in Northeast Illinois tell a similar story. There, we had 225 volunteers help 73 families in Jesus’ Name. Patricia had flooding in her crawlspace. Two of our team members donned Tyvek suits and crawled through an access panel to see how we could help pull out wet insulation and address minor mold issues. After our team completed the work, Patricia told our group how she and two of her sisters had all lost their husbands in the last two years. We encouraged her from the Scriptures and prayed with her. Patricia thanked the Lord and our team for everything that was done for her. We rip up flooring damaged by the floods. Later that same day, two crisis-trained Billy Graham Rapid Response Team chaplains went to check on one of our teams and visit with the homeowners. They inadvertently parked on the wrong side of a one-way street, and two residents approached them to correct the honest mistake. The four ended up having a great conversation, and God used the chaplains to lead the men to receive Christ as Savior! Afterward, when the chaplains went to see the homeowners they intended to visit, they told the chaplains that they had been praying for their neighbor friends. Praise God for answered prayer. Samaritan’s Purse also continues to help homeowners in West Virginia and Ohio after recent flooding. Please pray for that ongoing response. You can learn more about serving through our volunteer network.